Hello and Happy Sunday....I'm just doing an edit to this page. I decided to add a cute little pumpkin to my page. I'm sure when my grandson sees this he's not going to recognize himself. He's now 10 years old. I think his sister will love this page. She'll get to see her brother as a baby! So...nothing new. Just an added photo. 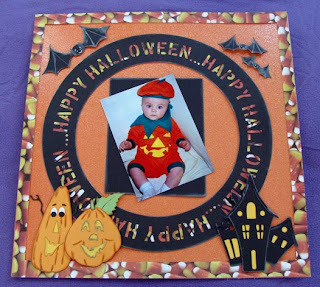 I spent part of the day making cards at Paradise Scrapbook Boutique....check her blog to see what we made: http://paradisescrapbookboutique.typepad.com/ When I came home I decided to work on my Halloween page. I finished it last night...with the exception of the drop cut border, all other graphics were cut using my BossKut Gazelle. There was quite a bit of chalking to do, but without it, the graphics are quite flat looking. Off to cleaning the mess I made in my craft room. Enjoy your day!